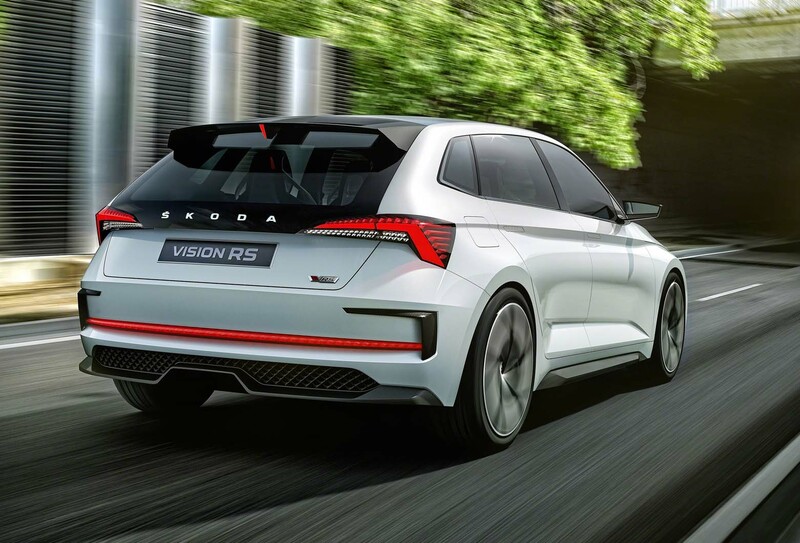 Skoda has set the stage for its forthcoming Volkswagen Golf and Ford Focus rival with the Vision RS, a concept car that features a performance plug-in hybrid (PHEV) powertrain. Under the sporty details and concept flourishes, the Vision RS is close to how next year’s Rapid hatchback will look. The fact that it has been previewed in vRS form, complete with 242bhp PHEV powertrain, shows how much further upmarket the new Rapid will go compared with the current value-led model. Skoda will drop the slow-selling liftback version and concentrate on the Spaceback hatch for the new Rapid. The concept is 4356mm long, just over 50mm longer than the current Rapid, and has a 440-litre boot, up 25 litres. The basic structure of the concept’s interior will be kept for the production version, Stefani said. That includes the “signature line” of the dashboard, with a central dip in which the free-floating touchscreen sits. The Rapid will be built on the VW Group’s MQB A0 platform that will also underpin the new small SUV that Skoda will launch next year, based on the Vision X concept. Skoda won’t put the Vision X’s four-wheel-drive hybrid drivetrain into production, but it almost certainly will launch the Rapid with the front-wheel-drive plug-in hybrid set-up as previewed on the Vision RS. This combines a 148bhp 1.5-litre turbo petrol engine and a 101bhp electric motor to give a total output of 242bhp and a claimed 0-62mph time of 7.1sec. The 13kWh battery will give a potential 43-mile electric range on the NEDC cycle and duck below 50g/km of CO2 on the stricter WLTP test regime. Other engines are likely to include 1.0-litre and 1.5-litre turbo petrol units, as well as a diesel model. Expect the new Rapid to be priced from around £16,000, about where the mid-range SE Tech versions start today. What do you do if you’re a brand like Skoda, known for good-value, no-nonsense cars, but you’re forced to adopt expensive electrified tech to meet regulations? Answer: you fit it to the vRS high-performance version, where the higher price can mask the extra cost. That’s why the Vision RS features a plug-in hybrid powertrain, and it’s a tempting prospect: 242bhp, the satisfying feeling of driving a torquey electric car, and sub-50g/km CO2. Skoda will launch 10 electrified cars by 2025. They won’t all be vRS badged, and Skoda has insisted they won’t all be crazy money. But by starting with a vRS model, Skoda can hide the costs and add desirability. Looks quite good. The current Rapid Spaceback is too long and narrow, with an under-wheeled and "hunchbacked" appearance. Moreover, it makes no sense as it holds less than the (better looking?) Fabia Estate, rear seats up or down. Our local taxi firm won't be happy, though. They run a few Rapid Liftbacks and Toledos, which are cheap and reliable. The Rapid 'liftback' (confusingly though correctly called hatchback) and rebadged Toledo are underrated great value for money cars. Not the cutting edge, but tried and tested VW parts bin technologies. The spaceback has something of the Austin Maestro about it. I thought the regular saloon-shape hatchback Rapid at least differentiated itself from the Leon, whereas this mk2 Rapid looks like it'll be standing on SEATs toes. You're right about the Rapid being a simple, rugged car, but that makes it an uncomfortable fit in Skoda's current range. 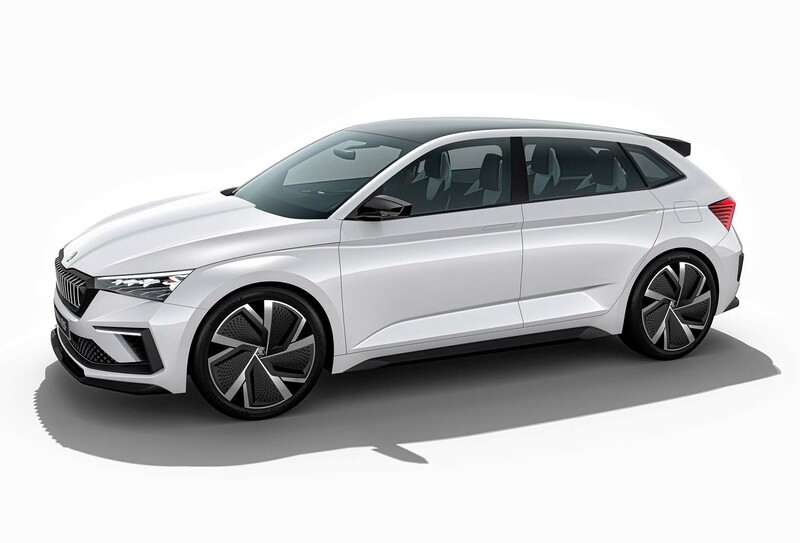 I think VW missed a trick by not differentiating their volume brands more distinctly and positioning Skoda more clearly as a value for money Dacia competitor. My brother-in-law had a Superb estate and now has a Kodiaq. Both could easily carry VW badges and probably take sales from that brand. He was considering a Passat until I suggested he look at the Superb instead. Oh, and you've nailed it with the Maestro comparison! Looks promising, but still dislike the cliche of the heavily sculpted door panels along the bottom. Yes, it does make the doors appear less tall, but it's a clumsy device - a sledgehammer to crack a nut.